Hi, I am interested in your 1965 Ford Mustang (stock #5048-CHA) listed on Autotrader for $34,995. I'd like to get more information about this vehicle and confirm its availability. 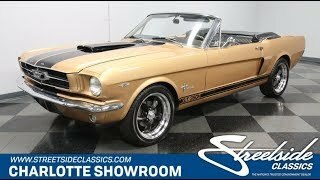 Dressed to look like a Shelby GT350H, this 1965 Ford Mustang convertible has a great sporty style that is only heightened by V8 power and its droptop appeal. Yes, there were no convertibles in the original batch of GT350H cars. So instead, this one helps us imagine what a first-gen rent-a-racer droptop would look like. It has the distinct look of the Hertz cars with the black and gold presentation, only now its reversed. And more than just the full-length glossy back stripes on top, this has a great Shelby-style attitude with the hood scoop, faux side ducts, and the GT350H graphics within the rocker stripes. Plus, the black American Racing Torq Thrust wheels and a crisp back folding roof gives this a very well-coordinated dark side. If you like the way the black top coordinates with the exterior accents, then with the flip of a switch, youll love how this powers down to reveal a full black interior. Plus, with the gold paint highlighting the doors and dash, this really is a terrifically coordinated package inside and out exactly what you want on a convertible. In fact, youll love all the details in this one, like the wood and chrome steering wheel, as well as the premium pony package seats. So this is the kind of interior youll be proud to share with the world. Under the hood is Fords famous 289 cubic-inch V8. While it looks quite proper for a C-code car like this, youll also notice some cool Shelby-style flair on the long Cobra air topper. More than just look good, this one is a true cruiser. The V8 fires up cleanly, makes a sweet sound from the dual exhaust, and theres even an aluminum radiator to help keep it running cool. Plus, theres a three-speed automatic transmission, power steering, and the grip of modern ZR-rated tires to keep this one feeling confident on the road. Complete with owners manual, this is the Mustang that dreams about delivering the car we all wish existed. So if you love a cool classic droptop, call today!